Identifying a surgeon who was able to articulate in plain language what he was doing was critical to the success of the venture. 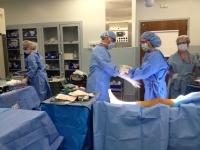 But John’s decision to allow cameras into the OR was the lynchpin that gave us the chance to educate more than 3,500 viewers who were tuned into his surgery as it live streamed on the homepage of Cleveland.com. In addition to the live broadcast, live tweets from the surgery were sent out from St. Vincent Charity’s Twitter account (@stvincentCMC). Viewers from as far away as Seattle followed along with live tweets, photos and videos from the operating room using the hashtag #stvknee. Lauren Wilk is a marketing and volunteer coordinator for St. Vincent Charity Medical Center.